The traditional ecclesiastical structure for the organisation of the Catholic Church, at the local level, is a geographical diocese under the authority of a bishop. A bishop appointed as a Diocesan Bishop, i.e. one entrusted with the responsibility of leadership of a diocese is conferred with ordinary jurisdiction and in canon law is known as an Ordinary. The important point here is that ecclesiastical authority does not reside in the ordination to the episcopate, per se, but in the the appointment of being an Ordinary. Assistant bishops in dioceses are an example of bishops who are not Ordinaries, ie they do not possess the capacity for ecclesiastical jurisdiction in their own right. However, just as not all bishops are Ordinaries so too not all Ordinaries are bishops. The most common example of non-episcopal Ordinaries are abbots and some other heads of religious orders. Abbots exercise ecclesiastical authority within their own communities. On formal occasions, such for solemn professions, abbots will dress in mitres and possess a pastoral staff (even though they are not bishops) to signify they are acting in their capacity as an ecclesiastical Ordinary. The diocese is an example of a geographical ecclesiastical administrative structure. There are, however, a few non-geographical dioceses with the military ordinariates being the most common example of these. 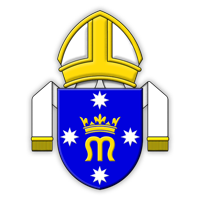 The Catholic Military Ordinariate of Australia is constituted by catholics in the Australian Defence Force across the whole of Australia and wherever else in the world ADF members are deployed. This non geographical diocese is administered by a bishop with the faculties of an Ordinary and thus this organisation is known by the term ordinariate. Catholic family members of an Ordinariate member; baptised Catholics who complete the Catholic sacraments of initiation through the Ordinariate; non-Catholic baptised Christians of another ecclesial community and non-baptised individuals who enter the Catholic Church through the Ordinariate.